Take Action With Native Plants in Your Backyard! Native Plants are the focus for this month of the Year of the Bird. Perfect timing, as its time to start planning and planting for the spring! Whether you have a garden, backyard or urban outdoor space, birds rely on what you offer them for their safety, food supply and shelter as they migrate through, overwinter or raise their families. Landscaping using plants which are native to the area where you live offers birds and other wildlife the full range of what they need to survive. Plants that are traditionally used for landscaping are often “exotic” — meaning they come from somewhere else. They may look beautiful, but the insects that are attracted to these plants are not the ones our local birds need to survive. 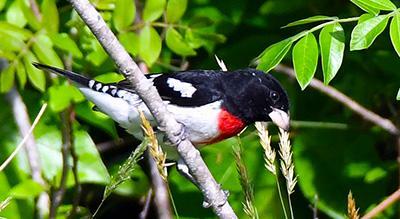 If you want a healthy population of birds around your house, start by planting native plants. And watch your birds keep those insect populations down and stay well-fed at the same time! Cornell Lab of Ornithology explains why native plants are essential to a healthy yard for birds, and has some suggestions how to get the job done. Need some help finding out which plants are native to where you live? Audubon has a database to help you find the plants, what birds they attract and where to buy them locally. What happens when non-native plants take over? Read this from Birdlife International.